The steep ridge into the Shira Caldera, a high altitude desert plateau. The desert zone is stark yet beautiful as we make our way to our spectacular lunch spot at 14,500 ft.
No reviews yet for this trip. Browse other reviews below for Tusker Trail. After arriving at Kilimanjaro airport, you check into our hotel. We spend two nights in Moshi allowing you time to regenerate and meet with your guides as they give you a detailed climb orientation and gear check. After breakfast we have a short drive from our hotel to the Umbwe Gate at 4,590 ft, passing through villages with small banana groves and coffee plantations. After signing in at the gate, we follow the winding trail up through the rain forest, climbing the ridge between the Lonzo and Umbwe rivers beneath the massive tree canopy. The path offers some spectacular views of deep gorges and glimpses of Kibo Peak off in the distance. Our scenic camp is perched between huge trees and thick undergrowth. Not far from camp you'll notice that the forest starts thinning out. We climb more rocky terrain with undergrowth and trees draped with "witches beard." Following the ridge, we gain altitude, occasionally seeing Kibo Peak towering in the distance. 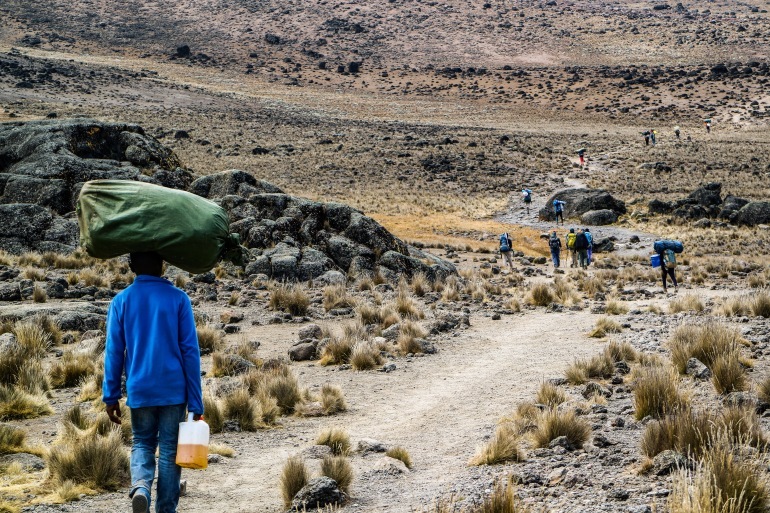 As we approach Barranco, the path flattens out and then descends into Barranco Camp. After breakfast we begin our trek out of the Barranco, climbing out of the canyon up towards Lava Tower with Kibo Peak towering over our right shoulder. The trail from Lava Tower takes us downhill into the Shira Caldera, where we camp for the night. After breakfast we hike northeast across the Shira Plateau towards Moir Camp, tucked away at the end of a massive gorge, at the foot of a giant lava flow. We enjoy a hot lunch at Fisher Camp, which is only a couple hours from our destination. From the foot of Kibo Peak, we start our traverse of the northern slopes with a climb up to the Lent Mountains, towering two thousand feet above our campsite. The desert zone is stark yet beautiful as we make our way to our spectacular lunch spot at 14,500 ft. Then we trek downhill to Pofu Camp. After breakfast we continue eastward. Mawenzi Peak starts getting closer, and the Kibo Saddle comes into view as our trail intersects with the Marangu Route. Kibo Peak and the Eastern ice fields on the crater rim perch over our right shoulder. We descend to Third Cave Camp. We cross the far northwestern section of the Kibo Saddle, which sits between Mawenzi and Kibo peaks. Even though our elevation gain is 3,200 ft., we are well acclimatized to the altitude having spent the last few days hovering in the 14,000 ft. level. The climb up the western part of the saddle up to Kibo hut is fairly strenuous, as we trek up the scree slope. We repack our gear, taking only what we'll need for the night in the crater. Today's the toughest day, with the most stunning views of Mawenzi, the Kibo Saddle, and the plains below. We slowly wind our way up over the rocky outcrops and scree until we reach the rim of the crater at Gillman's Point. After lunch on the rim, we push for the summit. The view from the summit is dramatic. The weather and altitude determine how long we stay here. After our summit celebration we descend to our Crater Camp for the night, facing the Furtwangler Glacier. From Crater Camp it's downhill to Barafu Camp, and then down to Mweka. We enjoy a celebration meal and savor our last night on Kilimanjaro. In the morning we have a 4-5 hour walk down to the gate, where the Tusker vehicles meet us and take us back to the hotel and a well-earned shower. Your climb is NOT subcontracted, Tusker operates your climb. Transfers to/from Kilimanjaro International Airport (JRO). 3 hotel nights in Moshi. 2 before the climb, 1 after. If you descend early, 1 ‘extra’ hotel night in Moshi free of charge. All meals, from snack on arrival night, through lunch on your final day. Transfers to/from park gates in 4x4 vehicles. Park fees for you and all crew. Subject to change by park authorities. Services of Tusker guides, cooks and porters. Group climbs led by multiple medically trained professional guides. Mountain cooks trained by Culinary Institute of America. Meals and menu designed by the Culinary Institute of America. Hot breakfast and dinner every day while on mountain. Hot lunch most days. Picnic lunch a few days. A Tusker porter to carry 30 lbs of your personal gear. As much purified water as you can drink while on the mountain. Tips – we suggest US$375 per climber to cover the entire crew. Also bring some extra for tipping hotel staff and drivers. Preferred beverages while in Moshi, such as bottled water, soda, beer/wine. Hotel in Moshi if you descend early and require more than 1 night.